Roller Derby can seem complicated and chaotic for the initiated. Once you understand the positions, the rules, strategy and game play, it’s easy. And it’s fun to watch and play. Learn about the game in this guide we are calling Roller Derby 101. 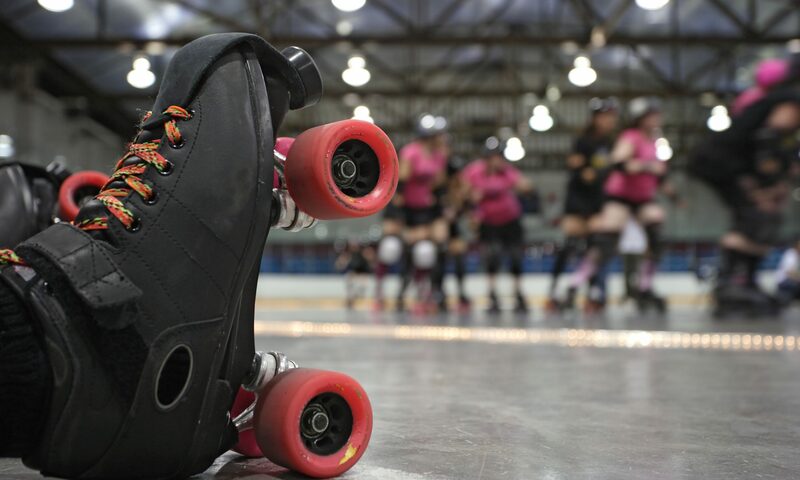 Most Roller Derby today is played on a flat track and follows the rules and regulations put forth by the Women’s Flat Track Derby Association, often just called WFTDA (sometimes pronounced Wiff-Dah). Co-Ed and Men’s leagues also follow these rulesets. 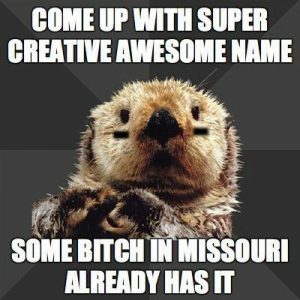 Many men’s leagues are a part of the Men’s Roller Derby Association (sometimes pronounced Mur-da). The game of Roller Derby consists of two 30-minute periods. Each period is divided into “jams.” Each jam lasts up to two minutes, with a 30 second break in between. The 30 second pause between jams allows skaters time to get into their correct positions. Jammers must start behind the jam line. Blockers and pivots can start anywhere in between the jam line and the pivot line (see image above). If all skaters are not in position at the beginning of the jam, the jam starts without them, and the team will skate short. The jam timer (a non-skating official standing in the middle of the track with a stopwatch) announces when there is 5 seconds to go before the jam start. This is the last opportunity for skaters to get on the track and get into position. The jam timer will blow one whistle blast to signal the start of the jam. After the jam has started the blockers can start to move around the track in a counterclockwise direction. The jammers leave their starting area with the goal of being the first jammer through the pack. 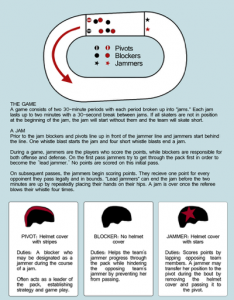 The first jammer to legally (without penalty) pass all opposing blockers on the track is considered to be the “lead jammer.” Earning lead jammer is important because that jammer has can call off (end) the jam any time they wish. This can be before the two minutes are up. Occasionally, neither jammer will earn lead jammer status. When this happens the jam will last the entire two minutes. Lead jammer status can also be lost if the lead jammer commits a penalty and is sent to the penalty box during the jam. If this happens, the jam goes the full two minutes. You can easily identify the jammer on the track because they have a star on their helmet. Meanwhile, blockers have plain helmets or a helmet with a stripe on it. The stripe indicates that the blocker is a Pivot Blocker. The Pivot Blocker has all of the same abilities as a regular blocker, however they can also turn into a jammer if needed. Sometimes a team of blockers will be so successful at stalling and keeping the opposing jammer stuck in the pack that they aren’t able to escape to score points. If this happens the jammer can remove the helmet cover with the star on it and hand it off to the Pivot Blocker. Only the jammer and Pivot Blocker can touch the star helmet cover. For example, if it falls on the ground it cannot be touched by anyone else on the team! What is a Star Pass? 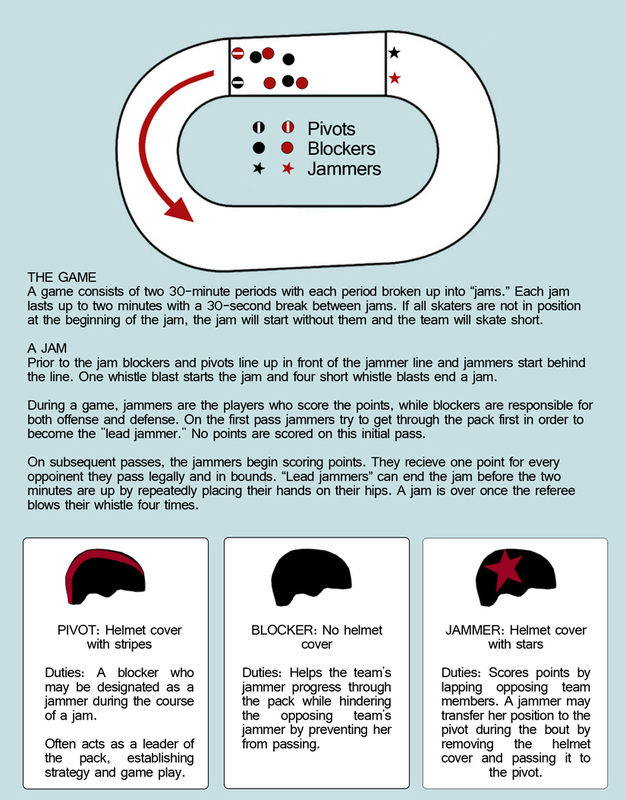 When the jammer hands off the helmet cover it is called a “Star Pass” and the Pivot blocker now becomes the jammer. The previous jammer is now just a regular blocker. They cannot become a jammer again during that jam. A pivot that receives the star pass cannot become lead jammer during that jam and if a lead jammer passes the star to the Pivot they forfeit their lead jammer status for that jam. A jam continues until two minutes has elapsed or the lead jammer calls off the jam. The lead jammer calls of the jam by tapping their hips with both hands in repeated succession. The jam ref (referee skating along with that jammer) will blow 4 short whistle blasts to signal the end of the jam. If there is no lead jammer, and the jam comes to its natural conclusion of two minutes, the jam timer will blow their whistle in the same manner. This signals the end of the jam.